On Wednesday, the United States District Court for the Western District of Washington barred Motorola Mobility from seeking the enforcement of a German patent ruling it might win before the court in Seattle has adjudicated Microsoft's FRAND licensing claims. A hearing after which one particularly important claim (breach of contract through excessive demands) will be decided is scheduled for May 7. 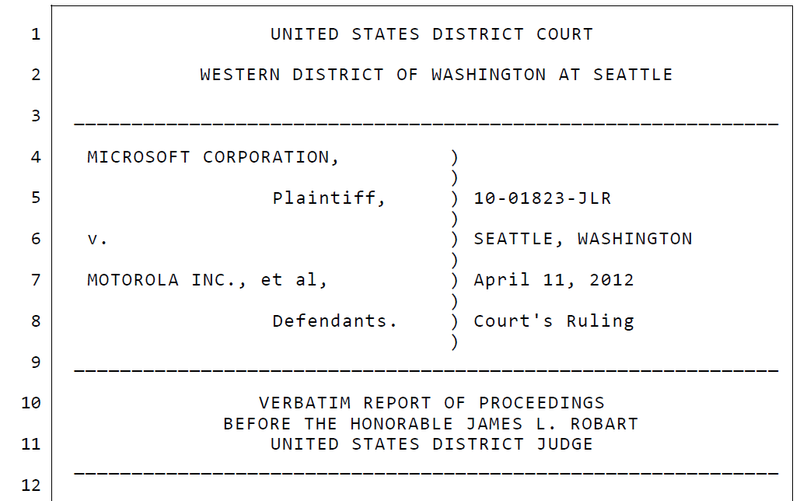 Today, Microsoft filed a motion asking the ITC to extend the target date for its ruling on Motorola's claims against the Xbox gaming console by two months since large parts of that case could be taken care of by the FRAND enforcement litigation in the Western District of Washington. As of now (prior to a decision on Microsoft's motion), the target date for an initial determination by an Administrative Law Judge is April 23, 2012 (ten days from today), and the target date for the final ruling is August 23, 2012. I uploaded the complete exhibit to Scribd. It's quite interesting to read the reasons Judge Robart gave on Wednesday. He held that even the highest legal standard one could possibly apply to the motion under the law was met, and therefore granted the motion. Both the ITC complaint over the Xbox and the Mannheim lawsuit against Windows 7 and the Xbox were filed after Microsoft's FRAND enforcement lawsuit in Seattle. Microsoft's lawsuit alleging Motorola's breach of FRAND licensing commitments was filed on November 9, 2010. 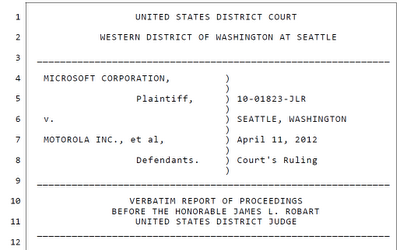 Motorola filed its Xbox complaint almost two weeks later, on November 23, 2010, and its Mannheim complaint in July 2011. The order in which complaints are filed bears significant weight in this kind of context. When Motorola brought those complaints, it knew that under normal circumstances those would be decided well ahead of the FRAND case in Seattle. Not only is Germany a country in which it's particularly easy to win injunctions based on standard-essential patents (of course, provided that they're valid and infringed) but the ITC also applies a different set of criteria to its decisions on whether or not to grant import bans than U.S. federal courts do in connection with injunctions. An ITC import ban is effectively an injunction, but the ITC's governing law ("Section 337") is different. Motorola clearly sought the leverage that the threat of disruption represents. Every party to a patent dispute would like to gain such leverage, but significant parts of Motorola's conduct raise FRAND issues. Four of the five patents Motorola is asserting against the Xbox at the ITC have been declared to be standard-essential (two of them relate to H.264, like the two patents in the Mannheim standard-essential patent case, and two others relate to IEEE 802.11, known as WLAN or WiFi). FRAND-based defenses and counterclaims cannot be brought as effectively in Germany and at the ITC as in U.S. federal court. Microsoft's ITC motion denies that there's an infringement of even a single claim asserted by Motorola Mobility but proposes at any rate that the ITC wait in order to benefit fully from the forthcoming Seattle findings. In recent months, the ITC has been very receptive to public interest concerns. Standard-essential patents raise even greater public interest issues than, for example, the potential impact of an exclusion of a few phones (by one of numerous Android handset makers) on the adoption of, and investment in, 4G networks in the United States. If I had any influence at or over the ITC, I would definitely advocate that the ITC grant import bans based on standard-essential patents only under extraordinary circumstances (if ever). In my view, the owners of standard-essential patents shouldn't be able to win ITC import bans, or even come close to winning them, before they have (at least) made a truly reasonable and non-discriminatory licensing proposal to a defendant. The ITC refers to its import bans as "exclusion orders". Exclusionary enforcement and standard-essential patents need a divorce in all jurisdictions and venues.